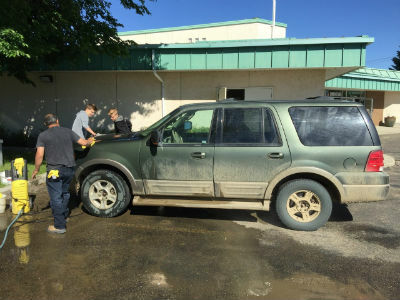 Earlier this summer, the Wetaskiwin Church of God, in Wetaskiwin, Alberta, Canada, hosted their first Car Care Saturday. I was considering some of the needs in the community, as well as the skills of the people in the congregation. That was when I heard of a sister church in Edmonton that provided car services for their single mothers small group. 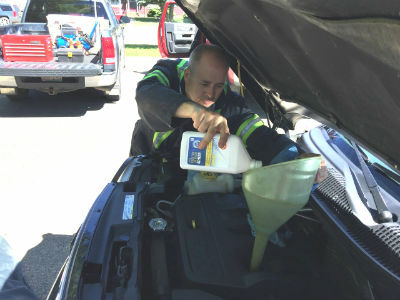 The Wetaskiwin congregation recruited about fifteen to twenty volunteers to provide a free oil change and car wash for single parents and widows who responded to our invitations. We advertised on Facebook, passed out invitations at community events, and spread the news by word-of-mouth. Various people in the church chose to sponsor an oil change with a minimum donation of thirty dollars. In advance of the event, we asked applicants to fill out a form that collected details about their vehicles so we could obtain the oil and filters. One of our local auto-parts stores donated the filters and sold us the oil at a reduced rate. We also benefited from the local McDonald’s that donated coffee for the welcome center we set up in the foyer. The coffee, combined with the baked goods provided by the congregation, made for the most amazing spread you’d ever see while waiting for your vehicle to be serviced! Some of our volunteers took on the role of host and made our guests feel welcome. Photo: Wetaskiwin volunteers helping with the car wash. The last lady who stopped by saw a car being washed and thought it was a fundraiser. When she was informed there was no charge, she asked what we were doing. When we explained that we were doing free oil changes for single parents and widows, she replied, “I’m a widow. Can I get my oil changed?” Absolutely, we were happy to do so! While her car was being washed, a filter was obtained for her car. The service was completed, and she was so filled with gratitude to have stumbled upon our Car Care project. Our volunteers worked so well together and everyone left with the deep satisfaction that comes from serving others. There are plans to continue this outreach event next year, with the hopes of it becoming an annual expression of our love for the community. Nathan Wiebe is the senior pastor of Wetaskiwin Church of God. Learn more about the Church of God movement at www.JesusIsTheSubject.org. This entry was posted in All Church of God, Western and tagged AB, Alberta, Canada, car care, community outreach, Nate Wiebe, Nathan Wiebe, service project, single mothers, single parents, Wetaskiwin, Wetaskiwin Church of God, widows. Bookmark the permalink.